It was truly a Yam and Sago Delight over the weekend. I bought a yam on Sunday and decided to make dessert out of it. It is my very first yam purchase in my entire life! And it is all because of this blog. You see, having this blog motivates me to try new recipes now and then so as to keep things going. So, anyway, after discussing some potential ingredients with my wife, we decided to have a dessert consisting yam, sago, pandan leaves (screwpine leaves), gula melaka and evaporated milk. We used the slow cooker (crockpot) to cook the yam in the afternoon (so that we can have a nap!) and the slow cooker did its job after 2 hours. Later that evening, we cooked the sago, added it into the slow cooker together with gula melaka and pandan leaves and hey presto! We had the most fragrant and delicious dessert to savour after meal. We kept some in the fridge and last night, we had the cold dessert version and was blown away by how great tasting it was. This recipe is now going to be a regular feature in our home! Boil yam in 3 bowls of water in a slow cooker at high setting for 2 hours. Alternatively, boil it in a pot at low heat for similar period but you might want to increase it to 3 1/2 bowls of water as evaporation is higher by cooking it in a pot. After cooking the yam for 1 1/2 hours above, add pandan leaves and gula melaka. Meanwhile, place sago in a strainer (just like picture above). Bring water to boil in a pot. Get ready another big bowl with cold / iced water. 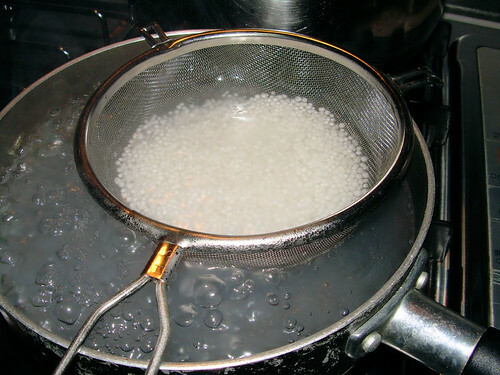 Place strainer into pot and boil the sago whilst stirring the sago with chopsticks or fork. Once sago has turned semi-translucent, bring strainer over the bowl of cold water and stir the sago through the cold water so as to prevent clumping. Bring back sago into the boiling water and boil for another 2 to 3 minutes. By now, at least 50 to 70% of sago should be translucent. Then, add strain the sago and add into the slow cooker. Continue cooking for another 30 minutes. 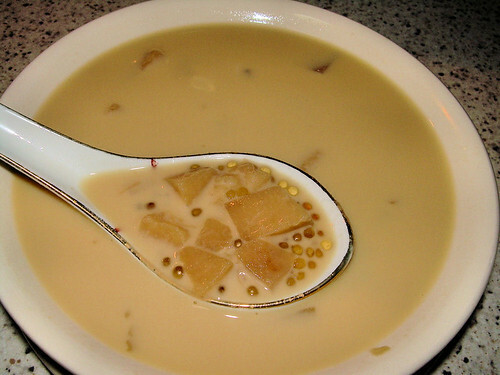 The dessert can be served hot or cold after adding evaporated milk in the serving bowl. yam, sago and gula melaka are the best combi! next time add sweet potatoes too! Wow… you cook good dessert!